Ant Ballet has been featured on New Scientist‘s blog today! Read the article here. 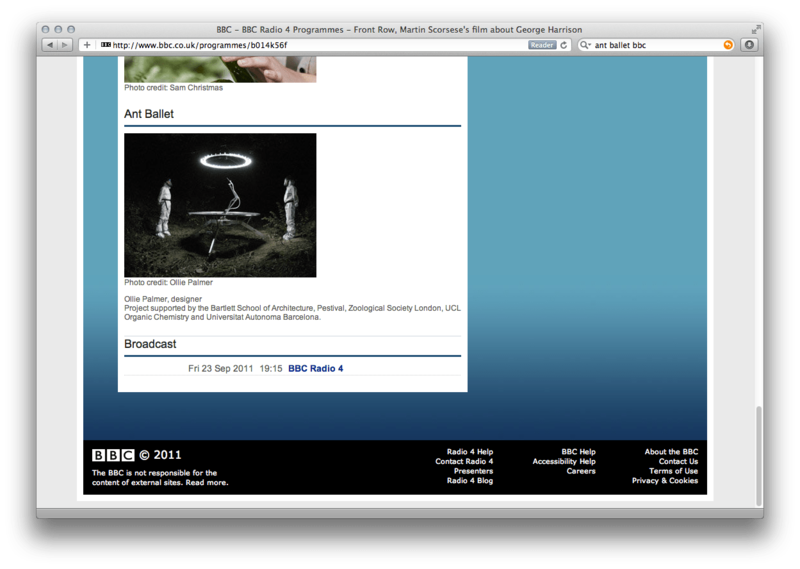 Pestival director Bridget Nicholls was featured on the BBC Radio 4’s Front Row programme today. She spoke about the Suzanna Soares‘ Am I Attractive?, Chris Watson‘s Bee Symphony, and my Ant Ballet project. Whilst running a workshop at the CCCB in Barcelona, Open_Sailing took part in an interview with Roberta Bosco of Spanish daily broadsheet El Pais. You can read the article on the El Pais website or download the PDF here. Open_Sailing was featured on the independent Chinese news channel NTV. You can watch the segment below, or here. Open_Sailing is proud to announce that it is the winner of the 2009 ARS Electronica Next Big Idea prize, with a three-month residency in Linz, Austria and a place at the ARS Electronica show in September. We’re hoping to float the Open_Sailing prototype on the Danube (where we’ll be living on-board), so that visitors will be able to board, explore and imagine their own life on the ocean. Open_Sailing crew recently took part in an interview with Regine Debatty of We Make Money Not Art.